Listening – how many times have you been asked, be it by your parents, teachers or bosses if you are listening to what they are saying? It is no surprise then that listening is a vital skill one needs to equip himself with in order to help manage conflict at the workplace. 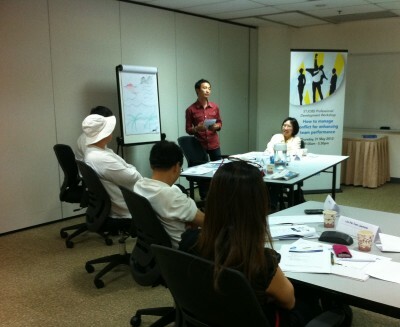 According to Ken Wong, a leadership coach and CEO of Pro-Active Training & Education – a regional training and management consultancy based in Singapore, listening is an important skill which is not applied often enough at the workplace. “Listening is the key to engaging your co-workers or bosses at the workplace. The most important things one must remember when listening are: listening with an open heart and mind, making eye contact with the speaker, not being judgmental of the speaker and not interrupting the speaker. This way, conflicts can be minimised,” says Ken. Through role-plays, sketches and team discussions, participants learnt how to tackle and minimise conflicts at the workplace, be it at a supervisory or co-worker level. Ms Murni, a Buddhist nun from the Singapore Buddhist Lodge, found the workshop very insightful and was excited to share the skills that she picked up at her counselling sessions with those who have family and work problems. “I can apply what I’ve learnt today to help them find their own solutions to their problems,” she says. If you wish to find out more about the seminars and workshops that STJobs has lined up for the month of June, click here!